Please browse the classes using the tabs below. Our Infant program emphasizes the development of a sense of trust and peace in each child within a loving and nurturing environment. In the Red Hill infant program, each child is supported as a unique individual, encouraged to explore in a beautiful, safe, and orderly space with materials carefully chosen for their educational purpose and sensory qualities. Infants are provided with a safe space in which to grow, and freedom to move within that space. We provide ample time for the children to be on the floor, which enables them to move about freely. Physical, social, language, and cognitive development are a part of our Infant program. Our infants participate in lessons on Spanish, music, dance, art and gym. The Preparatory Junior class consists of both traditional and Montessori materials throughout the classroom. Children move freely in the room and are permitted to proceed at their own pace to explore and discover new activates. Children learn according to their own individual abilities and enjoy a sense of autonomy and spontaneity within their daily routine. Activities that enrich the curriculum include sensory materials, gross motor activities, music, art, language, dance, dramatic play, stories, and outdoor fun.The children are taught individually every day. Shapes, colors, numbers and tracing are introduced as well as site words from Red Hill’s reading program. Potty-training is also started when the child shows readiness. This classroom is designed to be a transition into our Preparatory Senior classroom. The Preparatory Senior room has a ‘Prepared Environment’. This means the physical appearance and the arrangement of the learning materials adheres to certain principles which focus on meeting the needs of the ‘whole child’. Our curriculum is Montessori based, and we also include new discoveries into our everyday teaching to further our advanced academic program. In Math we develop a strong academic foundation in our class. The Mathematics area is one of the fundamental areas. Children learn to Identify numbers, associate symbols to quantity, work on missing numbers, number order, writing numbers, number dictation, number recognition, place value, and addition. Red Hill Montessori takes special pride in our Reading and Language Arts program. Our children being to read at a very early age. We begin with flash cards and after mastering 50 words they begin reading our primary reader books. Storytelling, songs, finger plays, poems, and sound games are an integral part of the classroom and vocabulary enrichment. The purpose of the Sensorial activities is to help students sort out the many varied impressions given by the senses. These materials also help prepare them to be a logical, aware, and perceptive. Our Sensorial area provides the students with the ability to choose work, organize their work, focus completely on their work, identify the point of completion, and the ability to put away the material in order. The exercises in Practical Life provide purposeful activity, develop motor control and a sense of responsibility. 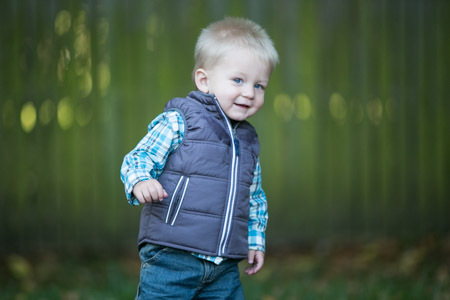 Both large and small muscle coordination and development are involved, helping a child to have control over his movements. Practical Life is organized into three main areas which are caring of the person, caring of the environment, and grace and courtesy. The aim of this area is to promote concentration, confidence, coordination, independence and sense of order. In Geography we study the life of man, the way humans live, and the way of life that has been established by a human society to sustain life. Our areas of concentration are land, air and water, the globe, mapping, puzzles maps, flags and Cultural enrichment. Maria Montessori recognized the young child’s need to observe and absorb information about the world around them. In our Science curriculum, we focus on living organisms, plants and animals. Some of our areas of concentration are living and non-living things, Botany, the parts of a tree, the parts of a plant, germination, life cycles, zoology, animals, butterflies and nutrition. In our class we encourage students to use our art shelf. A few choices on our art shelf are push pin art, coloring activities, cutting & pasting activities and play dough. All these activities help build their motor skills. The Goal of Montessori Education is to cultivate a natural desire in a child for learning. The carefully planned structured environment of our PreK classroom strives to do just that! Here the child experiences the excitement of learning by her choice and is helped to perfect her natural tools or skills for learning so that her abilities are at the maximum in future learning situation. She chooses her own work within a framework set by the teacher. The curriculum is molded according to the need of the individual child. The materials are child sized, self-correcting and organized to promote independence and success. We take special pride in our reading program. Our children begin to read at a very early age. Our children are provided with carefully designed, sequential opportunities to assist them as they build beginning reading concepts. They learn to read commonly used words through flash cards. They identify the sounds of the letters and learn to blend. Reading and comprehension plays a major role in language. Pre math skills are introduced enabling the child to recognize numbers and their values. More advanced kids move on to single and double digit Addition. They are encouraged to initiate their own activities and to work toward completion and mastery with responsibility for the classroom materials. They are encouraged to be problem solvers and critical thinkers. Our Classroom supports Peace Education. In our culturally diverse environment, they are encouraged to respect and appreciate each other. Our class is comprised of junior and senior Kindergarteners. A child’s curiosity is a powerful thing and constantly propels them toward new experiences. Our curriculum is broken down into five different portions: Practical Life, Sensorial, Mathematics, Language, and Cultural. Sensorial and Practical Life materials help develop gross and fine motor skills and coordination. Mathematics, Language, and Cultural materials allow the children to develop their academic abilities. Reading is taught by introducing phonics and sight words side by side. The children will complete 6 sets of Primary Phonics books in which each set covers new blends of sounds and more advanced sentences as the child moves forward. Advanced readers will begin reading chapter books such as Frog and Toad, Little Bear, Harry the Dog, etc. We practice handwriting on a daily basis through a variety of written activities. The children practice taking spelling tests weekly. Mathematics includes introducing 2 and 3 digit addition and subtraction. More advanced students will learn regrouping in addition and borrowing in subtraction. Other concepts that we introduce will include teaching the number line up to the thousands, the concept of time, simple graphs, and fractions, as well as teaching multiplication with skip counting. The lessons presented to the children are carefully sequenced to build a strong academic foundation. 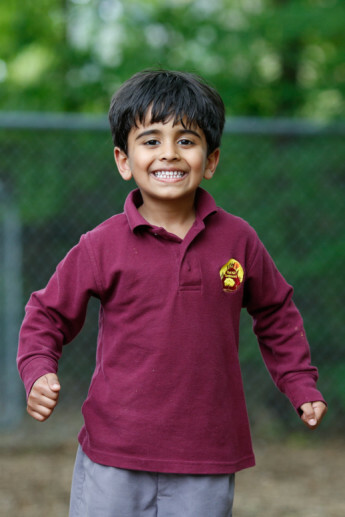 Kindergarten is a culminating year of the Primary cycle; it provides an extraordinary opportunity for 4 and 5 year olds to develop their leadership skills. Kindergarteners act as positive peer models for their younger classmates, assuming positions of responsibility that further strengthen their own capabilities and self-esteem. Everything that children have learned in previous years comes together in Kindergarten, giving children a readiness to meet new challenges. Tasks are separated into the smallest possible segments, so the children experience mastery along the way. This helps to build a strong sense of self, along with nurturing independence and responsibility, all hallmarks of our kindergarten program. The first step into the Elementary Program from Kindergarten. Both grades 1 and 2 are taught together, with emphasis on them being seen as individuals. The students’ growth is carefully observed and supported to encourage their natural development. Red Hill’s Montessori practice helps children develop creativity, problem solving, critical thinking, time-management skills and care of the environment and one another. These essential skills will prepare them to contribute to society to become fulfilled persons. As a Montessori Plus school we also meet all curriculum standards of education, leading our students to maximize their potential and learning. 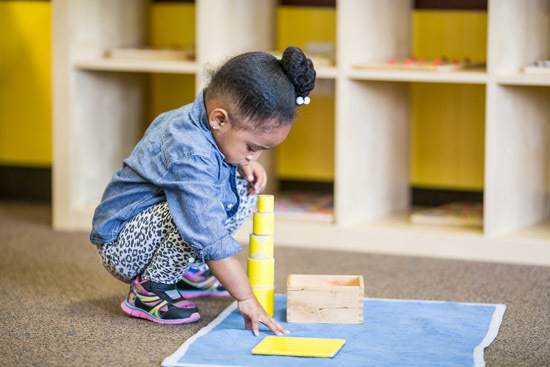 In mathematics, concepts are explained using Montessori materials, so the students understand the entire concept, not just how to do the process. In lower elementary we develop skills in addition, subtraction, multiplication and division with word problems for further understanding. We cover place value into the millions which leads into the concept of expanded form math. Students will also understand fractions, geometry (2D and 3D shapes), explore time and money leading into supporting word problems, work in measurement, read and graph data using pictographs, bar graphs, line graphs and pie graphs. We also do speed math drills weekly (Math Dash) to monitor all students’ progression in recalling facts. In reading, we practice independent reading daily and also implement reading comprehension. 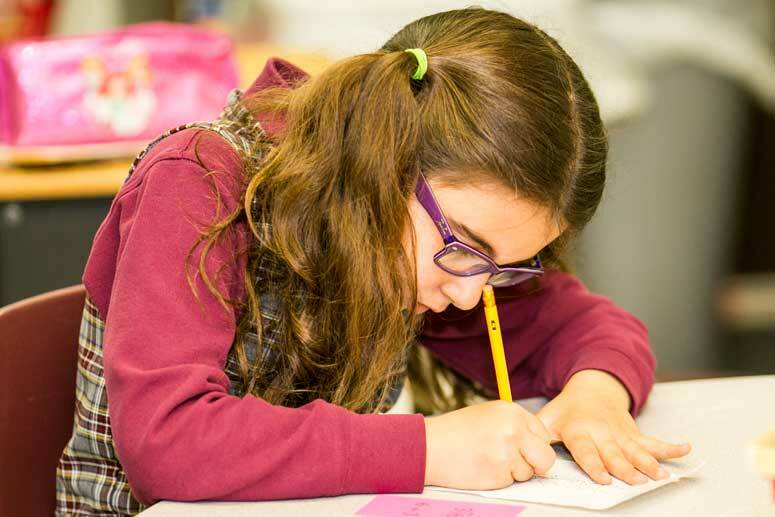 Each student is placed at their “independent” reading level and is given work accordingly. Guided reading in small groups is done weekly and followed up with questions to ensure comprehension. Some books read include and are not limited to: An I Can Read Books, Amelia Bedelia, Cam Jansen, Magic Tree House series, Horrible Harry series, Nate the Great series, and many more! In Language Arts, we implement daily grammar work including: nouns, adjectives, verbs, adverbs, homophones, homographs, and compound words. We also start to develop cursive writing, writing sentences, paragraphs, short narratives, stories, folktales, and poems. We also will incorporate computer skills into our weekly curriculum. Keyboard skills and the MobyMax program will be implemented in school and at home. In Lower Elementary, students’ present science fair projects, state-research, biographical research, recycle projects, and poems. We also will be doing fun hands-on experiments relating to our Science and Social Studies topics throughout the year. ~ Freedom of choice, which involves decision making, students’ select most work according to interest with guidance from the teacher. ~ A long period of independent work time is provided daily. ~ There is close student-teacher interaction that enables complete and precise evaluation of students’ progress in all areas of development. ~ Our classroom is peaceful, calming, and organized, and integrates art and nature, promoting a relaxed feeling. Upper Elementary consists of students in grades three through five. We are an extension of the Lower Elementary classroom and their curriculum; exploring concepts more in-depth using critical and high-order thinking skills. Students move from concrete representation to a more abstract and creative way of thinking through a variety of learning and teaching techniques. Student work is differentiated based on personal ability and skill strengths while working to maximize each individual student’s potential. Students are supported and encouraged every step of the way, ultimately developing a lifelong love of learning. Positive life skills play a large role in our classroom; students are continuously learning and practicing a variety of skills such as respect, integrity, responsibility, organization, cooperation, and many more. They learn the importance of being a good citizen and role model through community service projects and assisting with the younger students in our school. It is extremely important that students learn these skills at this developmental age so that they can become habits; something POSITIVE that they will carry with them forever. Daily, students spend the morning in our classroom learning core subjects such as mathematics, language arts, science, and social studies. 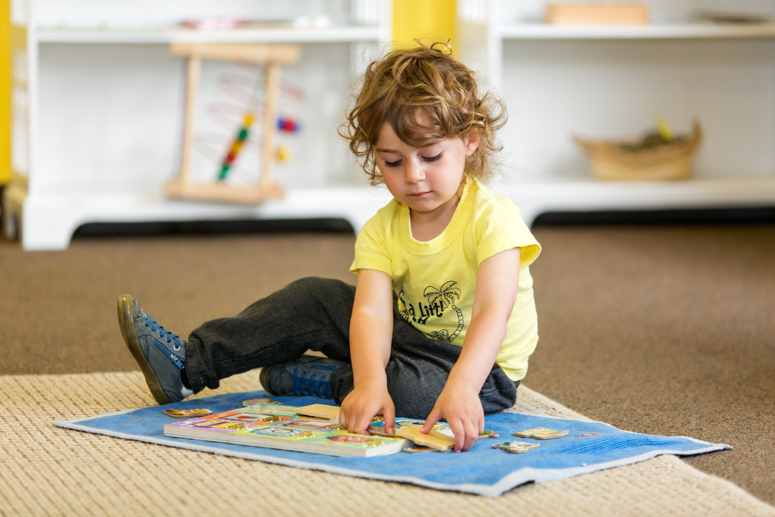 They are given the freedom of choice to choose their assignments; using decision-making skills and little to some guidance from the teacher, as demonstrated in Montessori Philosophy. With a smaller class size, students spend more one-on-one and small group time with the teacher and other classmates, ultimately strengthening the way they learn. Homework is sent weekly to extend the lessons that take place in the classroom and encourage good study habits. Students also learn research and presentation skills for our yearly Science Fair and other classroom projects and presentations that occur throughout the year. Students also learn about the importance of technology by learning how to type, research, and use the internet safely on our classroom computers.